Karen practices occupational therapy at the UW Health Yahara Clinic and specializes in treatment of patients with neurological disorders as well as lymphedema. She is a Certified Lymphedema Therapist, and also has extensive history in working with individuals after a trauma or burn injury. Karen is a member of the National Board for Certification in Occupational Therapy, and has presented at continuing education courses on edema management and splinting. 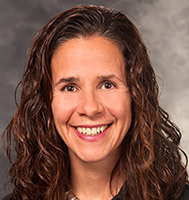 She was the recipient of the UW Rehabilitation Clinician of the Year in 2012, as well as the University of Wisconsin-Madison Clinical Preceptor of the Year. Karen sees patients upon referral from all providers.